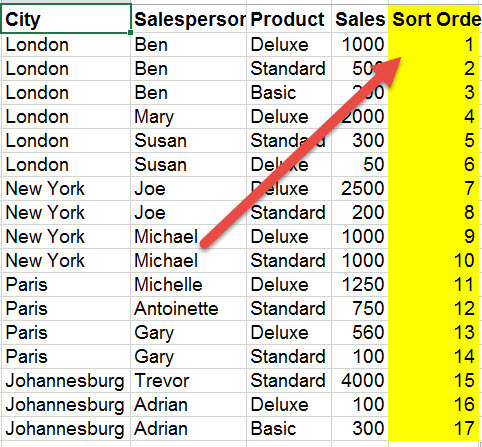 A common query is how to undo sort in Excel, i.e. you have sorted some information and for whatever reason need to unsort it again, back to its original sort order. If you have just sorted it, then you can simply push the undo button and it should go back to the original. The only time this would be a problem is if, while doing the sort, Excel warns you that the file is so big that undo will be disabled. However, you may find that you require the unsort much later in the process, maybe after deleting various items to clean the data. You want the original sort order but don’t want to undo all the cleaning and work you have done. In this case, right at the beginning you should include a sort order column as shown below. Important is that you don’t use a formula in this column or make sure that you copy/ paste as values the numbers. Now you can delete rows and sort in various ways, and when you want to go back to the original sort order, then just sort on this column. Performing an undo sort in PowerPivot is much easier, as a button has been provided to do this very thing. When you are in the PowerPivot window and have sorted some tables, you will see that the ‘Clear Sort’ button becomes available (as shown below). Click the button and you will go to the original sort order.